Low-end devices deserve modern software too. Google CEO Sundar Pichai said in early 2017 that emerging markets like India could really use smartphones that cost as little as $30. Android Go, which was announced at the company's I/O developer conference later that year, was a direct move toward realizing that vision. Long story short, it's a way to bring an up-to-date Android to experience to everyone, no matter how limited their budget. Here we are a year later, and we've seen Android Oreo Go edition devices popping up on store shelves around the world. ZTE has one. Nokia has a few, and Motorola and Samsung are gearing up to release their first. But what is it actually like to use? To find out, I've been testing an Alcatel 1X -- so far the only Go edition device available in the US. It's quickly become clear that Android Go is not only a software platform but also a series of compromises, intricately laid atop one another, all in hopes of making Android even better for cheap phones. Low-end smartphones often get stuck with old versions of Android, but with Android Oreo Go Edition, Google is trying to make sure even the cheapest devices get modern software. To be clear, it's not going to make a $100 phone run like a flagship device. Still, some under-the-hood changes mean this Go-edition software is more aggressive about shutting down apps that aren't in use and (more importantly) doesn't eat up as much storage space. Sadly, some of the Go apps designed specifically for these phones are pretty lousy, and Google needs to do a better job of flagging non-Go apps that actually run well on Go devices. Be the first to review the Android Oreo (Go Edition)? To be clear, Android Go edition isn't itself a distinct version of Android. It's a special configuration of tried and true Android 8.1 Oreo that's been optimized for devices with 1GB of RAM or less. That means Google put a lot of work into making sure its software runs well on low-end devices. Among other things, it nearly halved the amount of space Oreo takes up, which is crucial when you realize that some of these Go devices only have 8GB of internal storage. It also made the software more aggressive about memory management in a bid to keep things running smoothly. You'll notice a few interface tweaks as well, like a flatter view of recent app cards while multitasking, but this software runs just how you'd expect from Android on a low-end device. In other words, it's never amazing. Switching between multiple running apps in particular can be problematic because of the RAM limitations, but I've never been flat-out unable to do anything. Sometimes it just takes a little longer than usual. While Android Go will never make a cheap phone feel like a full-on flagship, it at least makes inexpensive hardware feel usable. Don't expect all flavors of Android Oreo Go Edition to look the same though. Smartphone makers have the latitude to skin this software just as they would full-blown Android -- thankfully, they've mostly exercised restraint so far. Just look at the Nokia 1: The phone itself might be cheery and colorful, but the brand's corporate owner, HMD Global, has left Android Go almost completely untouched. Meanwhile, Alcatel has skinned Android Go with its own lightweight launcher, and Samsung will almost certainly transplant the interface from its more powerful smartphones to its upcoming Android Go devices. I can't imagine custom skins would be any easier on limited hardware than the stock Android interface, but I'd be willing to bet Google made the concession to give smartphone makers a reason to embrace Go. Google's under-the-hood changes go a long way in making Android more usable on low-end phones, but there's more to the Android Go experience than that. 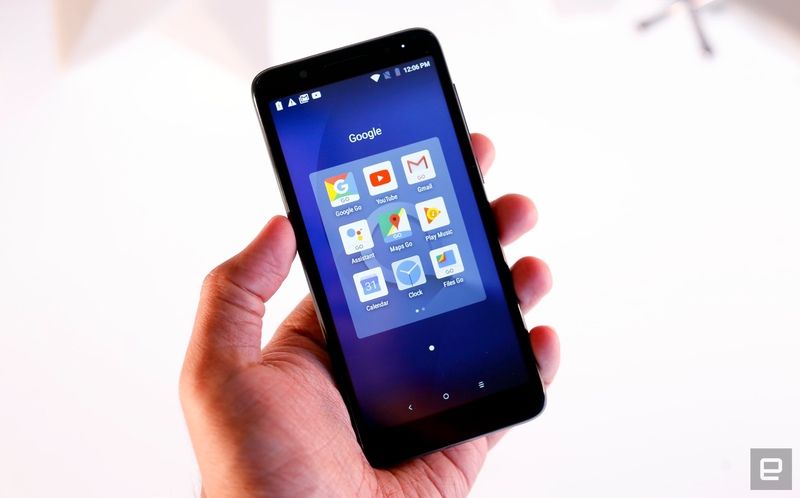 Fewer Google apps are preinstalled by default, and the ones that do make the cut aren't the versions you and I are used to; they're lightweight Go variants tailor-made for this kind of hardware. Using these Go apps has been the most fascinating part of getting to know Android Go, because it's clear Google has trimmed more from some apps than others. Gmail Go is a perfect example: I haven't noticed a single substantial difference from the standard Gmail app, aside from the amount of space it eats up. On my Alcatel test device, Gmail Go actually took up more space than its counterpart. (Go figure.) Then there's Files Go, an excellent file manager that among other things suggests ways to free up extra space and lets you send files to other devices through a direct WiFi connection. This is one of the few Go apps that doesn't run solely on Android Go phones, and it's so useful that it's worth installing no matter what phone you use. Google's compromises are more apparent in apps like Google Assistant, which still work well even on a cheap phone like this one. (Granted, that's because all the natural language processing happens on Google servers anyway; the phone just connects your voice to the cloud.) This isn't the Google Assistant you're used to though. You can't start a conversation by saying, "OK, Google." There's no keyboard for punching in commands manually, nor is there a way to set reminders. Oh, and all of those Assistant-powered services built by other companies? This version of the Assistant can't access any of them. Google had to give up a lot to get Assistant working on devices with 1GB or less of RAM, but that doesn't mean the Assistant isn't worth using. It's perfectly adequate for setting alarms, finding nearby restaurants and controlling your media, among other things. The basics are all accounted for, and more importantly, Google has said it'll make more features available over time. Through the process of testing Android Go, only one Go-friendly app has completely driven me up a wall: Google Maps Go. That's partially because it isn't a standard Android app at all: It's a progressive web app that runs directly in a browser window. As with Assistant, the basics are definitely here: You can look up points of interest and get directions from one place to the next without much trouble. That said, scrolling around the map is often sluggish, and the web app doesn't support turn-by-turn navigation at all. (If you try to get turn-by turn directions between locations, you're directed to download the full-blown Maps app instead.) Most puzzling is the fact that there's no way to save local area maps to the phone like you can with the full app. Remember, these phones are meant to help a new generation of smartphone users get online. The ability to download maps over WiFi would be a great addition for people in markets where data connections are spotty and costly. So yeah, the apps you'll find on an Android Go phone are currently a mixed bag. Unfortunately, the process of finding Android Go-friendly apps could (and should) be a little easier. To Google's credit, the Play Store treats Go devices differently than normal ones: It highlights Go and Lite versions of apps at the top of the store's landing page, and you'll be notified if an app you're looking at has an available Go or Lite variant. Every app you check out also makes its file size impossible to miss, so people can instantly weigh how each download will affect their limited storage. That sounds great ... until you realize the numbers themselves actually aren't that telling. Let's look at Google Pay: The Play Store listing said the package was 12MB, but when I started downloading the app, the install meter said I was downloading 7MB of material. Well, maybe 12MB is how much space the app takes up on a phone after installation. That would be helpful, right? It would be, but that's not it either: Google Pay ate up north of 20MB once installed. A little more clarity around those file sizes would be helpful, considering the limits these Android Go devices have to work with. Android Go has a clear purpose: to help cheap phones run better. That's a noble goal, but at this point, I'm not sure it's running on the right hardware. In most of the cases we've seen so far, Android Go is being pushed on devices that cost around $100, even though there are plenty of devices in that price range that run full Android more capably. To get a better sense of context, I started testing our Android Go review unit against a Moto E5 Play running Android 8.0 Oreo. 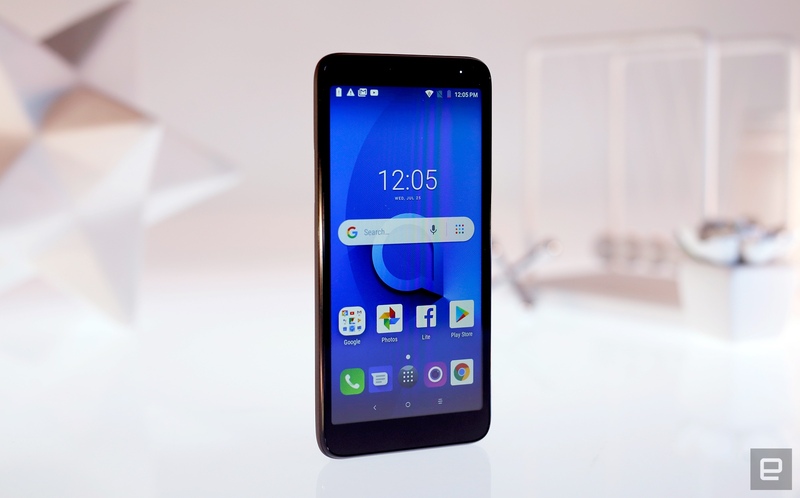 It only costs about $20 more than the Alcatel device, and one thing became immediately clear: Whenever possible, it's worth paying the small premium for full Android running on even slightly more powerful hardware. Where Go edition software really stands to make a difference is on even cheaper devices, devices that cost less than $100. Once you get down to prices that low, hardware limitations become so pronounced that these kinds of software tweaks have the power to make or break the experience. Thankfully, it's still early days for Android Go, and Google is apparently committed to it. Company executives have said that every future version of Android will get a Go configuration, and they'll only get better as Google continues to figure out ways to improve performance while squeezing in new functionality. For now, Android Go remains a valuable attempt at making Android worth using low-end hardware. It's just that many of us could easily find a more powerful Android device for not much more money. But once smartphone makers start putting it on the kinds of inexpensive phones that Pichai dreams of, Android Go's impact will be hard to miss.